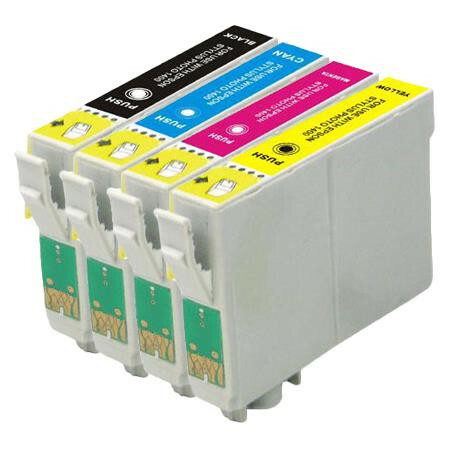 Epson T1285 (C13T12854010) High Quality Remanufactured Ink Cartridge. InkjetsClub's Epson T1285 (C13T12854010) High Quality Remanufactured Ink Cartridge are great fit for your Epson printer. Always shop for the best value and great quality. Not all inks are created equal. Epson T1285 (C13T12854010) Ink Cartridge are designed to provide high-quality prints that are color accurate. I'm very satisfied with the delivery and pricing for my order of replacement ink and will order more in the future. I found that the order process was easy, and very "user friendly". The shipment came in very quickly and the value was outstanding!! I will use this service again, and have already passed the information to 3 of my networks! Quick and easy. Great service. They came quickly in the mail. Reordering a color ink cartridge for my printer was very easy since my previous order was listed. The delivery was earlier than expected. Order arrived quickly and was complete. The ink prints well. I received my order quickly, I haven't installed product yet, if it preforms as expected I'll be very happy. If I'm happy I'll reorder and tell my friends. The shipping was very quick on this order. No problems putting in cartridges or with printing. Works great. Always a great price and shipping is quick. Will always be my first stop for ink refills! Product arrived quickly and the ink cartridges fit AND worked. The price was great. Always get my inks here. Cartridges work as well as Mfr. Originals, far better pricing! Prompt delivery and quick to reply to my questions!Thanks so much! I called to place the order and the woman was very nice. Fast shipping. Item in perfect condition. Excellent seller! My experience with InkjetsClub was very positive.The service was great as well as the products and especially the prices.I recommend them to anyone.I will continue doing business with them.